The National Archives The first 15 in. Rodman Columbiad produced, the Lincoln gun was mounted at Fort Monroe, VA, and named in honor of the president in 1862. The 15 in. 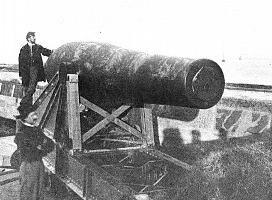 Rodman Columbiad was the largest artillery piece produced during the civil war. The Lincoln Gun was caste at the Fort Pitt Foundry. Sheads, Scott S. & von Lunz, Anna, "Rodman - Last of the Seacoast Muzzle-Loaders,"
Cultural Resource Managment 20 (1997): 16-17.